A while back I decided that printing out stuff to annotate was being a bit wasteful, so decided to get a tablet that allowed me to annotate a digital copy. Failing that i was looking for something that would display PDFs in a way more comfortable to read than viewing them on my mobile. Partly in a moment of impulse buy i decided to get the HTC Flyer, and despite some post-sales thoughts (the Flyer is more expensive than rival tablets such as the iPad) it is a decision I do not regret, although available software does not quite take advantage of the hardware as much as I would have liked. I have never really taken to capacitive displays, and have not quite understood the finger targeting algorithm used by them. 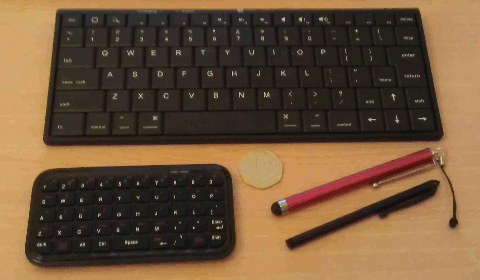 My last two mobiles (Nokia 6810 & Sony Xperia) were ones with hard keyboards that are designed for use with thumbs, whereas the Flyer keyboard is really designed for use with fingers, with the key height bring twice the width. Using the fingers of one hand takes some time to get used to. I suspect the software keyboard was not intended for extensive writing, and neither was the included notepad application. The keyboard layout when in portrait orientation is appalling, with one of the worst aspects being the location of the backspace and comma/semicolon keys being particularly bad. I think my tendency to press the wrong key is not helped by the zx..nm key row having keys wider than the upper 2 rows. To add insult to injury, the landscape keyboard layout merely shrunk down for portrait use would have been good, but that is not an available option. Particularly in landscape mode, the keyboard takes up a lot of screen real estate. Much the same issues over finger positioning as with typing. I think it is a major design flaw that the stylus cannot be used for navigation tasks when scribbling is disabled, which is mitigated by it being possible to buy capacitive stylus pens. Just make sure you get a decent one as the first one I ordered was basically as annoying overall as using fingers, due to its inaccuracy. It would also help if automatic keyboard pop-up could be suppressed. When using an external keyboard, poping up the on-screen keyboard every time you touch the screen to move the cursor is pure annoyance. You can select text using the keyboard, but there is no way to then cut/copy this selection, but that might be a fault of the text editing app I happened to be using. As soon as you type a letter into Google search it immediately does its 'predictive' search string page, and in the process hides the on-screen keyboard. And there is no obvious way to disable this auto search. Why on earth an Android device is setup by default to piss people off when googling is beyond me. Approximately A6 size (1cm narrower and taller), which is a nice size for carrying around, but for annotating documents (the original thing that attracted me to the flyer) this is a bit small. Partly mitigated by many Android apps being targeted at phones, so they are designed for proper-small screen real-estate. From portrait the Flyer only rotates to the left (i.e. counter-clockwise), which was a day one annoyance since the power cable I was using was plugged in to my left. The auto-rotation threshold is also a bit low for my liking, as sometimes I've put the tablet down on a flat surface, and the resulting tilt was enough to rotate the display. I think the threshold is 30 degrees whereas I think it should be over 45. All the accessories I bought are shown in the image below, alongside a 50p coin for scale. They are all fairly generic, and mostly bought off Amazon. This is the palm-sized keyboard shown in the bottom-lieft of the image above. I bought this off-the-shelf at a Maplin store I happened to pass by, and dispute being advertised as an iPad keyboard, it is not iPad specific.Charging is via a standard micro-USB connector, which is the very flat (only about a millimeter) variant of USB which seems to only ever be used on phones. Annoyingly a wall adapter is not included, so you'll need to charge it via a PC. This is the larger keyboards shown in the image. In order to pair with this keyboard you have to press the pairing mode button, which is located on a hole on the right-hand side (you'll need a pin or unfolded paperclip). This is covered in the instruction manual which is included on a small CD rather than as a booklet. Charging is via a standard mini-USB connector. I took to this keyboard quite quickly, as it allowed a typing speed more akin to using a PC workstation rather than what I was achieving with either the on-screen keyboard, or the BluBoard. However, it does have one major annoyance I have yet to find a workaround fix for: The Home key exits you from the editor to the main Android panel, and the End key turns off the display. To make matters worse these keys are in a location that leads to frequent mis-pressing, with the End key being where the right-hand Shift key is on full-size keyboards. . I originally tried the black stylus shown but did not like it at all, as the foam tip does not work well when used at an angle. It is cheap for a reason. The red stylus is a Boxwave Capacitive iPad Stylus uses a rounded end which works a lot better, although £12 is a bit much for what is basically a rubber on the end of a metal tube. On the whole I am doing stuff with my tablet I used to use my mobile for, and it has delayed me getting a new laptop for when I am away. Only thing I am yet to do with it is VNC'ing back to my flat, as I don't know if it supports PuTTY or any other SSL client that supports tunnelling and DSA keys. Takes getting used to, and £600 is a lot for a device I had to get used to. Maybe I should try writing Android apps, as that is why I went Android (and earlier, Windows Mobile) rather than Apple iPad. It is not a budget device though, and really needs buying of add-ons (and download of apps, and not necessarily free ones) to really appreciate. The HTC Flyer has the disadvantage in that is is pre-empting Android Honeycomb to some extent, and the software support is not quite there. Yet.